This meditation was specifically developed by Romy Valdez as a way to maximize the vibrational healing energy of the gong. It includes gentle yoga, conscious breath and a 40-45 minute gong immersion. The practice ends with chanting of mantra accompanied by shruti. 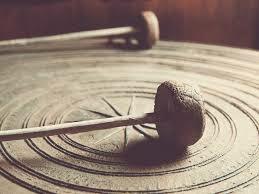 The vibrational energy of the gong supports the body in clearing physical, psychological and spiritual blockages and brings a deep sense of relaxation and renewal. Please bring any items you may need to be comfortable during meditation: mats, blankets, cushions, pillows, etc. We respectfully ask that any children attending this event be 8 years or older.